Minimalism is a pursuit. I'm in the back of the pack. Working to clear my inbox I found myself opening tabs willy-nilly and seeming to get nowhere. Marie Kondo would be ashamed. Getting my email read this morning has been an hour's work and then some. Part of it is to be expected. I'm home with my daughter who hurt herself yesterday and am happily distracted by her. That and almost every message either deserves a response or inspires me to think of things such as writing this. Paul Jarvis's newsletter says that he treats work like driving: he doesn't text or get distracted while driving. I like that. I like it a lot. But in the middle of this paragraph I got up to get my girl ibuprofen, put dishes in the machine, and check two messages that came in on my phone. I have several other newsletters in the inbox. They are like issues of The New Yorker piling up, leaving me gasping for time to read them all instead of just skimming the cartoons. I need some kind of systematic approach. There are eighteen emails in my inbox. I'm alloting fifteen minutes' work on that while chronicling the results here. Can I be both efficient and thoughtful? I begin with an email leading to a comment from Jerry on the blog. I posted this reply: I'm writing about going through my email inbox, trying to be efficient, maybe ruthless, but also thoughtful and open. Your comment here, for which I received an email notification, has led, as so many things do, not to a completed task but a happy desire to read more. It's almost like I'll never be done. Hey, there's a good idea for a bit of writing. A message from Syracuse Stage said I'll soon receive information about the upcoming season. There's thirty seconds of my life lost. Archived. Austin Kleon's newsletter led me to one of his posts and, God help me, a long article I want to read. I opened post and article in tabs and archived the newsletter. I archived Syracuse University's note about post-season tickets knowing another will come tonight. Buh-bye. Also archived was a note from my wife about which we argued this weekend. We've archived the argument too or snoozed it for later. We only argue about important stuff and often take weeks to work through. Thankfully, we don't hold grudges for long and I finally learned it's possible to be angry and still feel deep love. She knew that all along. Next was the copy of my own newsletter. I posted a link for that to Twitter, though I'm not sure why. I closed Twitter before I lost myself to it. I resisted subscribing to receive a Zen Quote Of The Week after enjoying one my friend sent. Isn't less more according to Zen philosophy? Instead of fifteen minutes, I took eighteen and went from eighteen messages to eleven but have eleven tabs open in my browser. I'll take fifteen minutes to clear some of those. I closed Android Messages and my copy of the newsletter within fifteen seconds. The Austin Kleon post was one I read earlier this week. I'm grateful for the Vonnegut quote, James Martin's three simple ways to be kind, George Saunders quote about kindness, Roger Ebert late post, and more, and could linger with that post for a long time. It would be nice if my posts were as useful. I closed it and moved on. I closed my blog post to which Jerry had replied by quoting Thomas Merton. Then I sent Jerry a link to an Alan Jacobs post about Merton and closed that tab too. ...that the things we pursue most frantically are the least likely to give us lasting joy and contentment, but there are other, truer things that we can train ourselves to attend to in the elusive pursuit of happiness. My time was up then and good thing since I'm rethinking the idea of cleaning my inbox, closing all the tabs, being done. It's almost like I'll never be done. Hey, there's a good idea for a bit of writing. Living is a series of complications. There is time to be ruthless, efficient, and dogged. There are times to let the river go by. "There are more things in heaven and earth, Horatio." It turns out that I have my dream inbox anyway. Not inbox zero, the completely organized and productive life, but one that is filled with the messages of friends and strangers that have me wanting to know more, to keep going, to respond in kind. 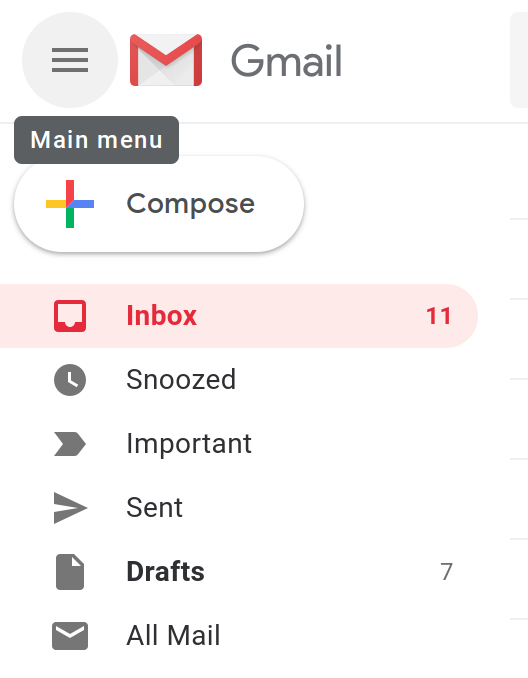 I have eleven messages still waiting, calling to me from my inbox and three tabs waiting for me to work through those articles. It's okay. This is the good stuff. But you know what's the great stuff? It's my daughter calling to me, asking me to come sit with her while she recovers from injury. It's the easy way in which I abandon the quest to be done and remember to go live my life.